Wydown Hotel has the feel of a well-appointed home as opposed to a hotel. A dozen bright and airy guest rooms, take advantage of natural light and feature contemporary, custom furnishings. Wydown Hotel partners with a spa just a few doors down to provide complimentary access to their fitness facility and 25-yard outdoor heated lap pool. The Wydown's location, right on Main Street in St. Helena offers easy access to some of Napa Valley's most romantic restaurants, wineries, spas and shopping. A fun fact: the hotel gets its name from Wydown Boulevard, a street in St. Louis, Missouri, the city where the owner was born and raised. 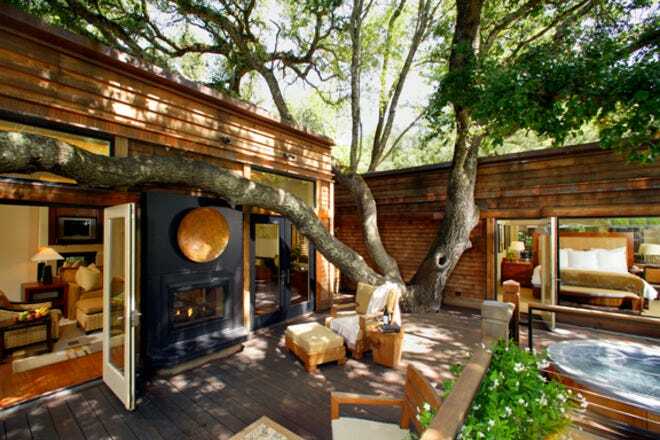 Overlooking the Napa River, the River Terrace Inn calls a scenic stretch of Napa home. Take time to wander along the river, or if you're feeling social, head toward town. The Napa Valley Wine Train, Oxbow Public Market and downtown Napa's wine tasting rooms and restaurants are just a 10 minute walk away. Guest rooms are stylish and modern. Some come with upgrade perks like whirlpool baths and balconies complete with river views. The fitness center and outdoor heated pool are nice amenities, but the complimentary cruiser bicycles offer a nice way to explore the area. Every evening between 5:30 and 6:30pm the River Terrace Inn hosts a complimentary evening wine hour where guests can sip and mingle before headed to dinner. You might want to skip dessert, because the hotel also hosts complimentary s'mores every evening from 9pm to 10pm. A weekend away only gets better when you can park the car and forget about it. That should be the plan when you check into the Westin Verasa Napa Hotel. Located on the Napa River, it's easy walking distance to the Napa Valley Wine Train, Oxbow Public Market and downtown. 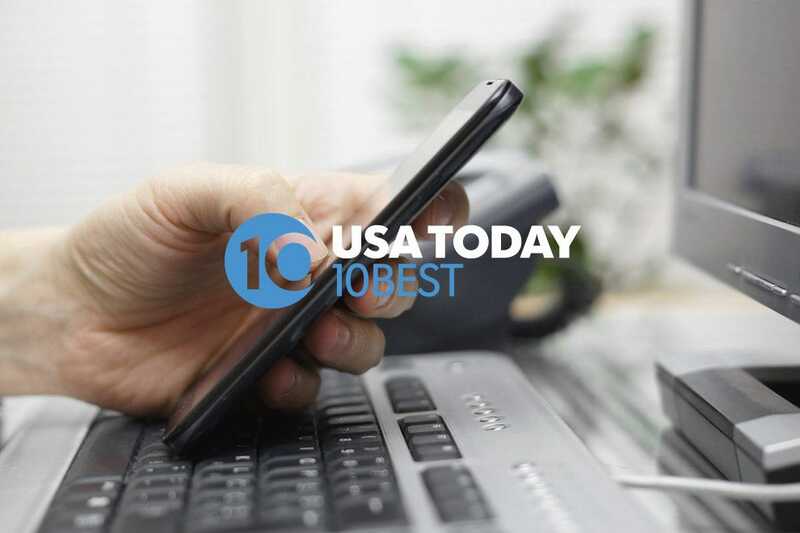 The hotel is everything you'd expect from a Westin and offers a great line-up of amenities. Along with a riverfront heated saltwater pool and hot tub, the hotel has a WestinWORKOUT® fitness studio, and a running concierge. LaToque, the on-site Michelin Star Restaurant, has a long list of awards to its credit. 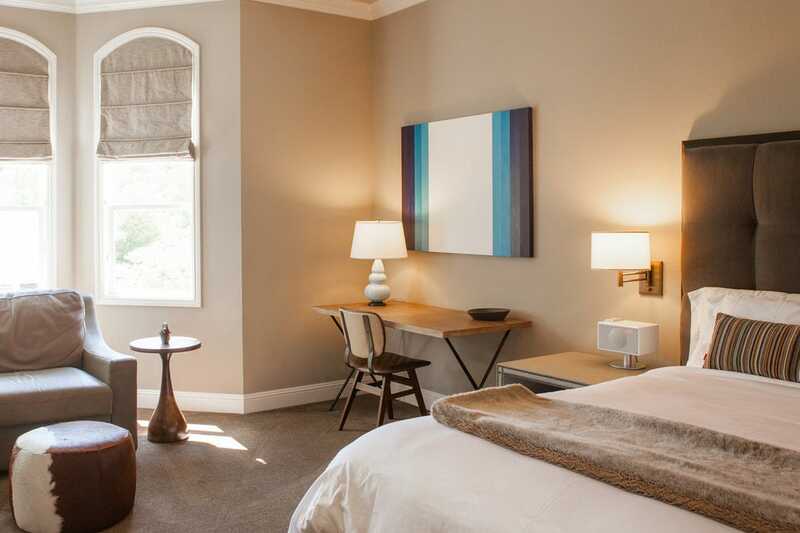 Located in a cozy historic neighborhood, steps from downtown Napa, the Inn on Randolph is the perfect romantic retreat. The 19th century property sits on nearly an acre and offers numerous nooks and crannies among its gardens to settle in and relax with a glass of wine, cup of tea or good company. Renovated from the studs up, there are only 10 rooms: five in the historic 1860s Victorian and five in adjacent cottages. Regardless of where you stay, the accommodations are romantic and private. Rooms respect their historic roots, but do it while providing modern and luxurious furnishings. The gourmet kitchen is gluten free and uses the inn's gardens to create breakfasts that will motivate you to get out of bed quicker. Less than 10 minutes from downtown Napa, The Meritage Resort and Spa is set against a hillside vineyard. Guests are encouraged to wander and explore among the grapevines during their stay. Under the acres of hillside is the Estate Cave featuring Trinitas Cellars wine tasting and Spa Terra. With more than 300 Tuscan-inspired guestrooms, The Meritage is a large resort that's constantly bustling with activity. Play bocce ball, lounge by the adults-only pool or take the complimentary shuttle to downtown Napa. On-site cuisine options include seasonal farm-to-table cuisine at the Siena Restaurant and sports bar fare at spirited Crush Ultra Lounge. In between bites guests can roll strikes in one of the lounges six bowling lanes. With just six rooms, Brannan Cottage is a luxury inn that seamlessly blends its historic past with modern touches. Listed on the National Register of Historic Places, Brannan Cottage Inn is the only 1860 Samuel Brannan resort cottage in its original Calistoga location. Lovingly restored, all rooms feature Frette duvet bedding and linens, heated tile bathroom floors and illy® Espresso. On Calistoga's many sunny days, the cottage side yard is a nice spot to enjoy doing nothing but enjoy the 350 year old Siberian elm tree that towers above. Located just steps off of Lincoln Avenue, Brannan Cottage Inn is an ideal launching point to discover downtown Calistoga on foot. Napa River Inn at the Historic Napa Mill is the perfect launching spot for couples who plan on doing some wandering while in town. Its waterfront location comes with scenic views and serves as a perfect starting point to walk to wine tasting rooms, restaurants and popular nightspots like Silo's and the Uptown Theatre. If you get tired of walking, bicycles are available to pedal through town. 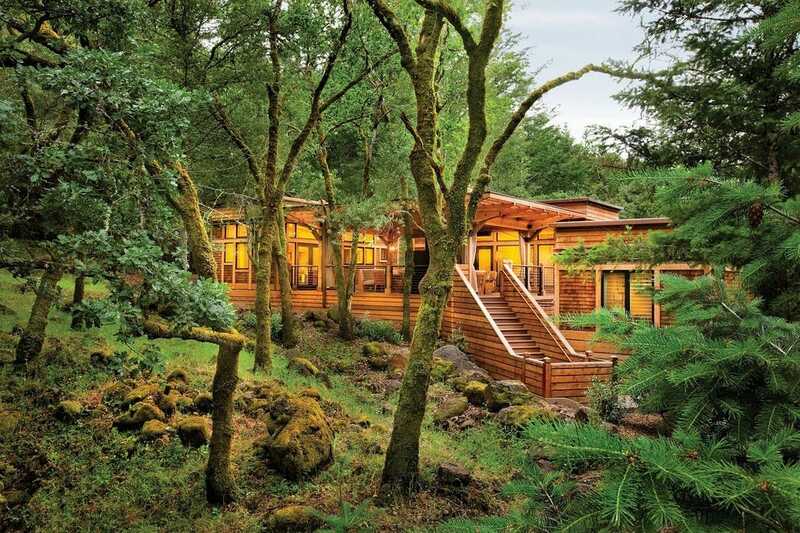 The Spa at Napa River Inn offers an array of relaxing services including couple's massages. Breakfast is delivered every morning from Sweetie Pies bakery, so there's no good excuse not to stay in bed. 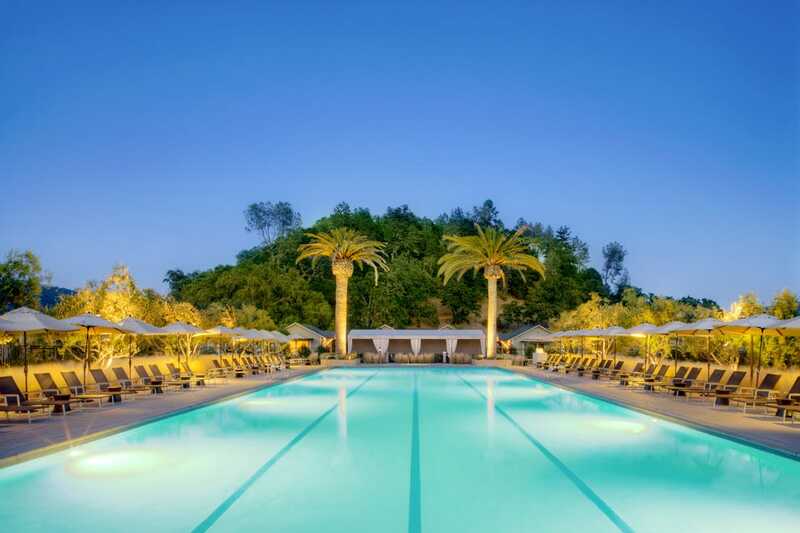 A stay at Solage Calistoga comes with anticipation, but when it comes down to it the resort is the type of place where you should expect to get excited, the moment you pull in. 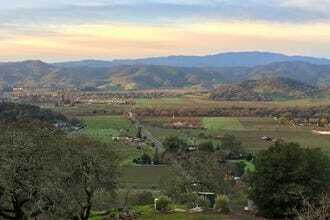 Set on 22-acres, the mountain and vineyard views don't disappoint, but they're only part of the picturesque setting. The 130-foot pool is a popular place to gather and relax, and complimentary cruiser bikes are available to cover more ground when you are exploring. The resort is also home to Solbar, a Michelin Star rated restaurant. There are a multitude of couple massage options, and Spa Solage also features two couple's rooms with outdoor soaking tubs and showers with garden patios and day beds designed for two. The gym and studio offers Pilates, yoga and spin classes. 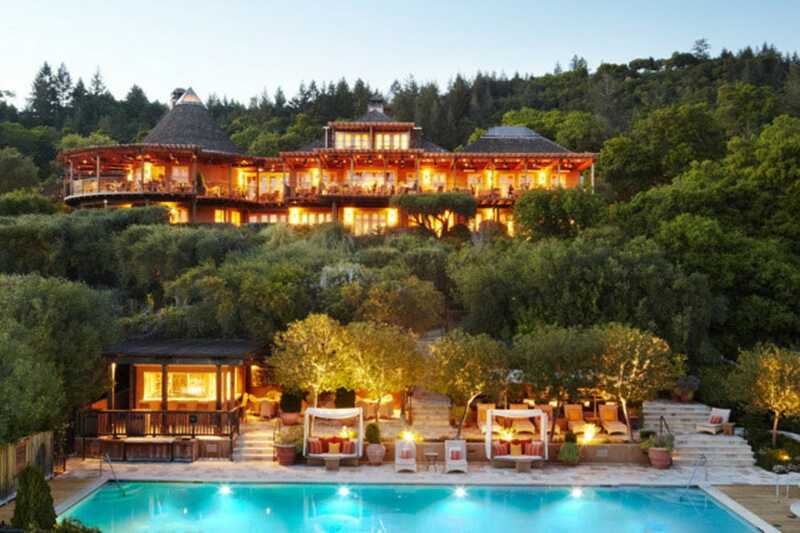 Located just off the Silverado Trail in Rutherford, Auberge du Soleil or "Inn of the Sun" is tucked away in 33 acres of olives groves. Along with extraordinary views, the luxury inn has an open-air sculpture gallery, Michelin-rated restaurant, and stunning pool complete with cabanas perfect for napping any time of day. The 50 rooms and suites ooze romance. From terraces with vineyard views, to wood-burning fireplaces, and extra-large soaking tubs, you'll never want to leave. The Auberge Spa is for Inn guests only. Couples will love the Melisse Suite, a spacious suite that features a fireplace, private outdoor garden and hot spring. Located in a secluded valley on 157 acres, Calistoga Ranch has 50 guest lodges that blend beautifully with their natural surroundings. Rooms focus on being comfortable and relaxed inside and out, and include outdoor living rooms and gardens where you can shower under the moonlight. Auberge Spa at Calistoga Ranch offers an assortment of pampering options for couples, but if you're really looking to impress that special someone, book the Spa after hours and you can have it all to yourselves for the evening. If you're looking for a heavenly experience, book a private stargazing session on the resort's observation deck. The guests-only Lakehouse Restaurant offers intimate fireside dining with lake views and the on-site vineyard and wine cave mean your glass will always be full.